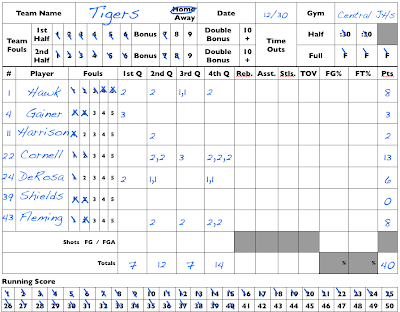 Keeping the basic stats of a youth basketball game is not that difficult. You really only need to capture four vital stats as outlined in Youth Basketball: How to Keep Score Part 1. Write down the team names for the home and visiting teams on the scoring sheets. You will be required to capture the vital stats for both teams. Write down the names and uniform numbers of each player for both the home and visiting teams. Hint: List in order of the uniform number lowest to highest. The action on the court moves very fast and you will need to identify players on the sheet fast too. Prior to the game meet with the scorekeeper from the other team (if there is one) and exchange rosters with players names and uniform numbers. If the other team does not have a scorekeeper, get the roster from the coach. The overall running score – on the bottom of each team sheet you will see that the running score boxes. The score of the game between the Bobcats and the Tigers was 41 to 40. The Bobcats won. Every time a 1 pt., 2 pt. or 3pt. shot is scored cross out 1, 2 or 3 boxes on the running score section of the scoresheet. Check the scoreboard often to see that the scoreboard score matches your running score. If they are different, find your mistake and correct it. 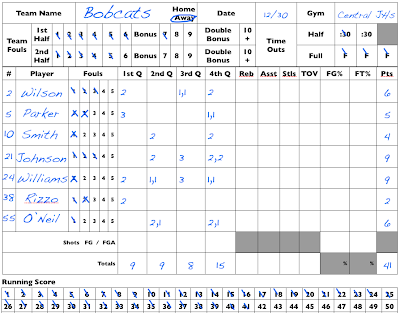 You can find your mistake by counting the individual points scored by each player or by referring to the scorebook kept by the opposing team. If you determine that your book is correct and the scoreboard is not, notify the scoreboard operator that they missed some points. This happens more times that you would think. A good scorekeeper can save a game. 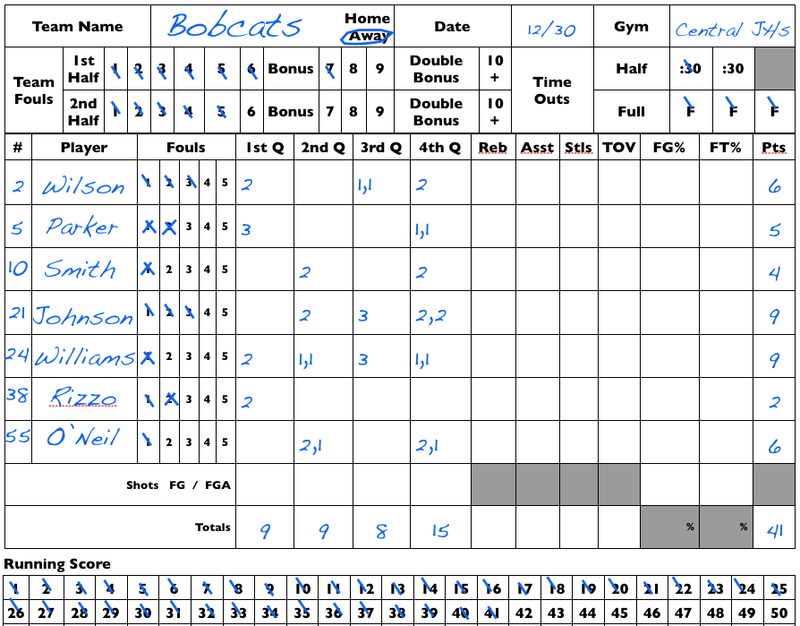 Ironically it is not critical to keep track of the points by each player, however it is recommended that after each basket you mark 1,2 or 3 points next to the player’s name in the column of the quarter that the basket was scored. You will notice that Bobcats player #24 (Williams) scored 9 points in the game. He made a 2 pt. basket in the first quarter. He made two free throws worth one point each in both the second and fourth quarters (total 4 points) and he sunk a 3 pt basket from beyond the arc in the third quarter. When a player makes a shot beyond the 3 point arc, the referee will put both hands up in the air. At the end of each quarter add the total points for the quarter. Make sure that the totals of the columns equal the total captured on the running score. 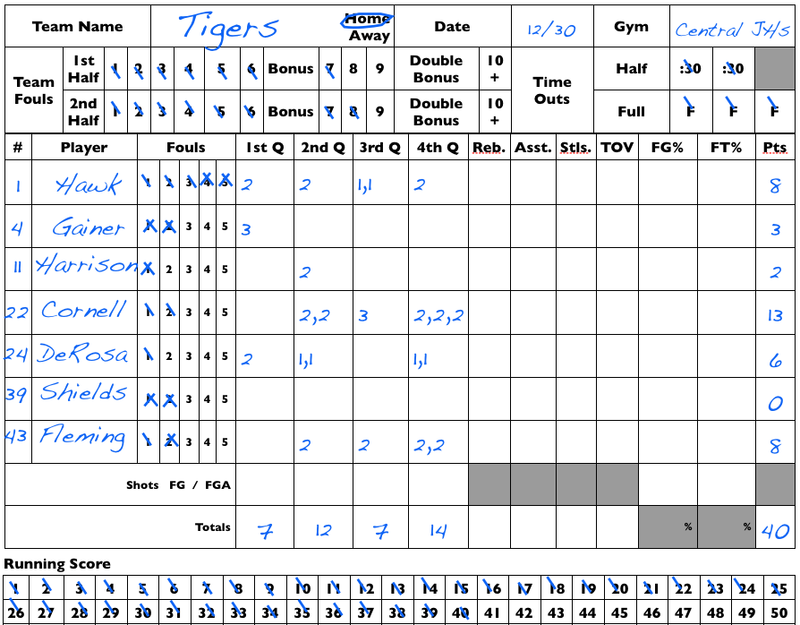 If you look at other scorebooks, you may notice that some scorekeepers use a circle and lines to capture free throws. A circle with no lines means free throw attempt, add a slash when one free throw is made and add another slash to make an X to indicate two free throws made. I use the simpler method of marking 1 point for each free throw, but feel free to use these symbols. Fouls by each team in each half - When a foul is committed by a player the ref will blow the whistle to stop the game and turn to face the scoring table. He or she will then indicated the type of foul and the uniform number of the player committing the foul. You simply cross off the number of the foul next to the player who committed the foul. Hint: If the foul was made in the first half, put a slash through the corresponding number. If the foul happens in the second half, put an X across the number. You will see that Bobcats player #38 (Rizzo) committed 1 foul in the first half and 1 foul in the second half. Making a distinction between the first half and second half fouls by player is not required but it helps you keep track of team fouls by half. After you mark the box for the foul on the player line, mark the box on the team fouls line too (see 3. below). Each player is allowed 5 total fouls in a game. After the 5th foul, that player will be ejected from the game. You will see (above) that the Tigers' player #1 (Hawk) fouled out of the game. When a player gets five fouls notify the referee. Fouls by each team in each half - When a player commits a foul, the team is assessed a foul too. After you mark the box for the foul on the player line, mark the box on the team fouls line too. A team is allowed 6 team fouls in each half. A bonus is awarded to the team fouled by a team that has already committed over 6 fouls in a half. The team fouled is in the bonus and is awarded a 1 and 1 for non-shooting fouls. A player gets a free throw for a non-shooting foul and is awarded a second free throw shot if and only if they make the first free throw. A double bonus is awarded to a team if a fouling team has committed 10 or more fouls in a half. The double bonus is an automatic 2 free throws to the team fouled on a non-shooting foul. Note: All shooting fouls are awarded 2 or 3 free throws depending on the position of the shooter on the court when he or she was fouled. If the shooter was fouled inside the 3 point arc then 2 free throws are awarded. If the foul happens outside the 3 point arc then 3 free throws are awarded. Keeping track of fouls is very important because many games are won or lost at the foul line. It's important to keep accurate count so that your team gets the 1 and 1 bonus shots they deserve. Note: Fouling is a strategic part of the game. Teams will often foul a player on purpose to 1) stop the clock or 2) force the opposing team to shoot free throws. A team would want the opposing team to shoot free throws for a chance to get the ball back late in a game. There is always a chance that the shooter will miss the free throw and the defending team can then secure the ball. Time outs by each team – Typically, a team is allowed three full (1 minute) timeouts and two 30 second timeouts. After a team calls a timeout, cross out of the corresponding number on the timeout boxes at the top of the scoring sheet above. When a coach asks for a timeout, the ref will blow the whistle to stop the game. The ref will then ask the coach if he or she wants a full or a thirty second timeout. If the coach wants a full timeout, the ref will turn to the scoring table and put both arms straight out to each side like a T. If the coach wants a 30 second timeout the ref will put both arms straight out to the sides like a T then touch his or her shoulders. Hint: The number of timeouts allowed by each team can vary depending on the league or tournament so it is a good idea to ask the ref prior to the game. The number of timeouts are often captured on the scoreboard too. Make sure that the number of timeouts on the scoreboard are consistent with the numbers in the book. If the numbers do not match consult with the other scorekeeper and correct your book or the scoreboard. Note: Basketball is a very strategic game and timeouts are key to the execution of the strategy. The timeout can be used to 1) set up a play, 2) to stop the clock or 3) stop the momentum of a hot team on a scoring streak. The strategic importance of the timeout makes this stat line important. The refs do not keep track of timeouts, they will look to the scoring table to get this key information. The coach of your team will also look to you for this information. Important Note: if your team takes too many they will be assessed a technical foul – the penalty is free throw shots for the opponent and loss of the ball. Keeping the basic stats is not hard to do if you have a basic understanding of the game, know some terminology and are attentive. Statsdad, I found your advice very helpful. I'm going to volunteer to keep score at my 13 year-old's game this afternoon. Thanks. Very helpful and explained well for any level. Quite impressive! Mostly we used to learn some basketball techniques while watching players and following the advice from professional coaches. It is very important to keep the scoreboard busy and for that, we should target for 3 points shoots. Thanks for such a wonderful article, it provides some essential points to learn about basketball techniques. 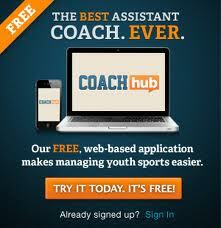 Really informative article for youth Basketball, Thanks for sharing your good article.